In Germany's Past, A Harsh Lesson For Now? January 5, 2010  Michael Haneke's The White Ribbon is a dark meditation on physical and psychological violence — and on the role repression in the name of virtue may play in the shaping of violent personalities. Set in a German village on the eve of World War I, the film's exploration of religion and authoritarianism has led some to call it a subtle look at the origins of Nazism. It may, however, be much more. 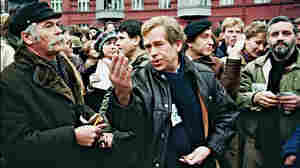 November 12, 2009  Communist rule of Romania ended 20 years ago in a bloody revolt that killed more than 1,000 people. The country is now a member of the EU, with a solid economy and a passionate, if hectic, democratic life. 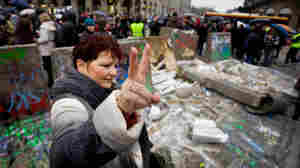 But some believe Romania's rampant corruption is threatening its future. November 11, 2009  Prague is brimming with commerce, optimism and tourists two decades after the Velvet Revolution overthrew the communist government and brought dissident poet Vaclav Havel into the presidential palace. But some Czechs worry their once dynamic political culture is declining and active citizenship waning. November 10, 2009  Two decades after striking shipyard workers in Poland helped to spark the end of communism, many Poles today — especially the young — are enjoying the fruits of capitalism. 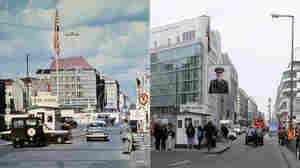 Since joining the EU in 2004, Poland has developed the most dynamic economy in Eastern Europe. November 9, 2009  Thousands of joyous Germans and foreign visitors to Berlin crowded into the city to remember the night 20 years ago that the Berlin Wall fell, an event that has come to symbolize the end of communism in Europe. 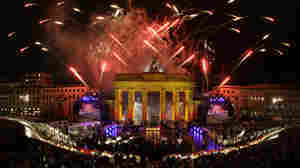 The celebrations included fireworks, concerts and the toppling of a row of giant dominoes to mark the anniversary. November 9, 2009  Twenty years ago, the Berlin Wall that divided the city and served as the symbol of a Europe divided between communist East and democratic West fell. 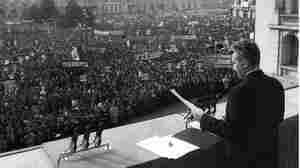 For one young German, that momentous day held both political and personal significance. October 21, 2009  The International Atomic Energy Agency says Iranian negotiators have agreed to a draft deal on its nuclear program. Diplomats say the deal would see Iran ship out most of its enriched uranium to Russia, stripping Tehran of most of the material it would need to make a nuclear weapon. October 20, 2009  In Vienna, three Western powers are holding talks with Iran aimed at convincing it to send most of its low-enriched uranium abroad for processing. That would keep Iran from processing it into bomb-making material. The International Atomic Energy Agency is hosting the talks with representatives of Iran, the United States, Russia and France. October 2, 2009  Iran has agreed to open its covertly built uranium enrichment plant to international inspectors. The agreement came in Switzerland in talks it held with six world powers. One EU official called the meeting productive but cautioned there is a long process ahead. The talks are to continue later in the month. President Obama has challenged the Iranians to follow up on their promises. October 1, 2009  Representatives from the U.S. and five other world powers outlined their concerns about Iran's nuclear program at a meeting in Switzerland with an Iranian delegation. U.S. officials held the highest-level direct talks with the Iranians in years. October 1, 2009  Representatives of six world powers sit down in Geneva with diplomats from Iran for rare face-to-face talks on Iran's nuclear program on Thursday. Iran says it won't discuss what it calls its nuclear "rights" and insists its program is only for peaceful energy production. September 28, 2009  For nearly eight years, Germany's mission in Afghanistan has been unpopular and controversial. German politicians don't seem to want to talk about it much. For the last three years, polls have consistently shown that two thirds of German voters oppose having troops there. Nearly 60 percent now say they want an immediate withdrawal. 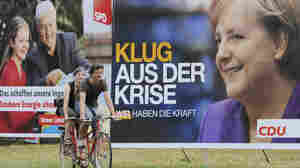 September 27, 2009  German voters handed conservative Chancellor Angela Merkel a second term and a chance to create a new center-right government Sunday, while her center-left rivals suffered a historic defeat in the national election. September 18, 2009  The decision by the Obama administration to drastically change U.S. plans for a missile defense shield in Europe has been met with mixed reaction from NATO allies in the region. September 12, 2009  German voters go to the polls in national elections at the end of September. But so far, it has been a lackluster race. Despite recent pressure on Chancellor Angela Merkel over German troops in Afghanistan and smaller parties' electoral gains, most Germans seem content with the status quo.